2014-15 Upper Deck Hockey has gone back to school. No, they didn't slip cards for the Rodney Dangerfield classic into packs. But there are some unannounced inserts that are turning out to be almost as rare as a Triple Lindy. 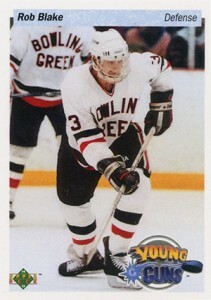 2014-15 Upper Deck Series 1 Hockey has a few NCAA Young Guns done in the style of the subset's debut 25 years ago. So far, Brian Leetch, Rob Blake and Curtis Joseph have surfaced. All are pictured in vintage photos taken from their time at college. 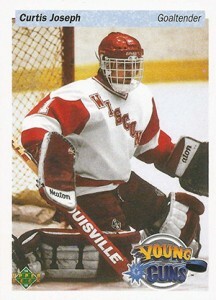 Like almost all unannounced inserts from Upper Deck, the 2014-15 Upper Deck NCAA Young Guns are not easy to find. In the first couple of weeks on the market, only a handful surfaced on eBay. These follow a bunch of similarly secretive SSP cards in both 2014-15 O-Pee-Chee and 2014-15 Fleer Ultra Hockey. Stay tuned for more details should they emerge. Please note that this list isn't confirmed as complete. More cards may exist. 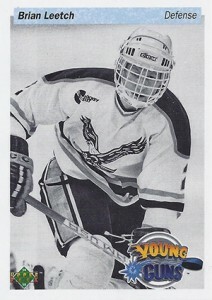 2014 15 UD Series One Curtis Joseph NCAA Young Guns SSP EASTER EGG! !